Disclaimer: This book was sent to me by the author, Robert Pence, for an honest review. Plot: After accidentally killing a Gypsy boy-scout, twenty year-old Otis Delaney has been cursed with the misfortune of only performing one good deed a day by the Gypsy boy-scouts mother. But while the Gypsy mother was brewing her curse for poor Otis, the Gypsy boy-scouts father throws in the merit badges of their dead son, in the hopes that it will help Otis. Not only does Otis now have strange superhuman skills, but the recent uprising of local flash mobs is causing havoc in the community. Now Otis must work to find a cure for his curse, and solve all of the chaos around him. Opinion: This book is so random, but in the best way possible. After reading the book description before I started the story, I was completely confused and had NO idea where this book was going to go. 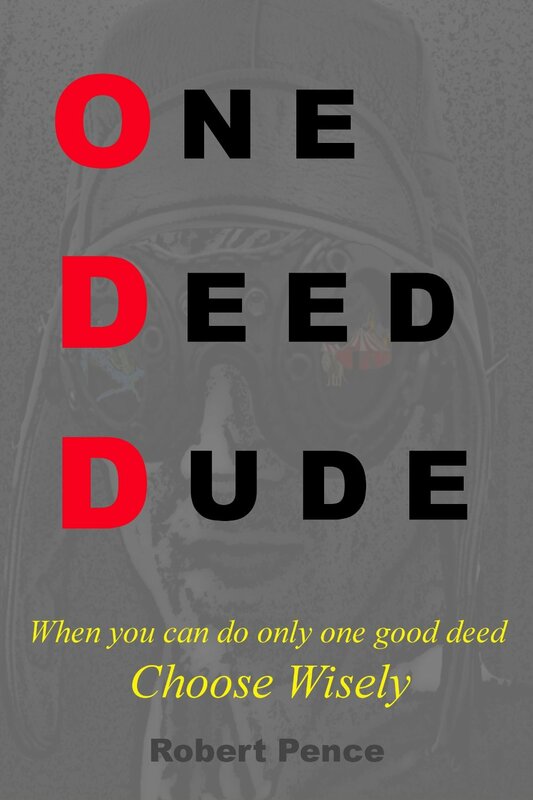 A dead Gypsy boy-scout, merit badges that give superhuman powers, curses and only one good deed a day…wait what?! Ah yes, you read that correctly. It’s not until you actually start reading the first couple of pages that you say to yourself: This kid named Otis is taped down to a skateboard being towed by a Ninja ZX-14R going about 80 mph, and he’s decked out in old school aviator gear? Well, now I HAVE to keep reading. Otis Delaney is living at the home of his grandmother Kathy, and answers the door one day to a Gypsy boy-scout who is selling popcorn. After Otis buys some popcorn, the Gypsy boy-scout informs him that Otis’s cat is up in the tree. Otis goes into the tree to recover his cat, but accidentally falls and crushes the Gypsy boy-scout which results in the boy’s death. Otis is soon cursed by the Gypsy boy-scouts mother who wants revenge on Otis for killing her son, even though the father knows it was just an accident. The Gypsy mother brews a curse that Otis will only be able to complete one good deed a day (which is A LOT harder than you might think), and if he doesn’t complete his good deed he will have terrible living nightmares. The Gypsy father, who is against cursing Otis, throws in his sons merit badges right before the curse is complete. This results in Otis being cursed with performing only ONE good deed a day, as well as a few superhuman skills to help him. As Otis and his best friend Harvey start to figure out what is happening to Otis, Otis’s relationship with his girlfriend Eve is fizzling away to a local biker named Raymond. But there is also flash mobs occurring all over town that only end badly. Soon Otis is visited by other people who have been cursed by the same Gypsy woman, and together they try to find a way to cure their curses. This is such a unique and different idea for a story, and I am so glad to have read something that is so different from a lot of the other books available to read right now. There is a little bit of everything in this story and it keeps the reader highly entertained and wanting more. The writing is done very well, I think I saw MAYBE one grammar mistake in the entire book. The character development is really great, I was completely connected with Otis and felt SO bad for him. The poor guy was just trying to get his cat out of a tree and he crushes a little boy, which is beyond terrible. Not only does he have to live with that on his conscience, but he is also getting so much criticism from his family and friends about the way he is acting after he has been cursed. I mean they held an intervention for him!! Didn’t they ever think that maybe it was him just being a crazy twenty year-old? The curses that were given to the other people that come into the story later were so hilarious as well. Curses ranged from a man having a third eye in the back of his head, a girl that couldn’t stop jumping rope, and another man that could not stop passing gas. I kept wondering to myself how long that fifteen year-old girl had been cursed with jumping rope and how she slept and ate food. A character that was less known at the beginning of the story and got to be a big part of it towards the end, was Nora. Nora is the best friend of Eve, which is the girlfriend of Otis. I wish the author could have gone into more depth on how Nora’s grandmother had all of these strange items for when they tried brewing their own curses, and how Nora knew so much about Gypsies. I think a background story on Nora’s grandmother would have added another interesting layer to the story. Overall, this was a very entertaining and exciting read. This book is suitable for all ages and for anyone that wants to read something DIFFERENT and FANTASTIC. Even if science fiction or fantasy type of books isn’t your style, I promise you won’t be disappointed!